↑ ୧.୦୦ ୧.୦୧ ୧.୦୨ ୧.୦୩ ୧.୦୪ ୧.୦୫ ୧.୦୬ ୧.୦୭ ୧.୦୮ ୧.୦୯ ୧.୧୦ ୧.୧୧ ୧.୧୨ "Rickets". Genetic and Rare Diseases Information Center (GARD) – an NCATS Program (in ଇଂରାଜୀ). 2013. Retrieved 19 December 2017. ↑ ୨.୦୦ ୨.୦୧ ୨.୦୨ ୨.୦୩ ୨.୦୪ ୨.୦୫ ୨.୦୬ ୨.୦୭ ୨.୦୮ ୨.୦୯ ୨.୧୦ "Rickets, Vitamin D Deficiency". NORD (National Organization for Rare Disorders). 2005. Retrieved 19 December 2017. ↑ ୩.୦ ୩.୧ ୩.୨ ୩.୩ ୩.୪ ୩.୫ Creo, AL; Thacher, TD; Pettifor, JM; Strand, MA; Fischer, PR (May 2017). "Nutritional rickets around the world: an update". Paediatrics and international child health. 37 (2): 84–98. doi:10.1080/20469047.2016.1248170. PMID 27922335. ↑ ୪.୦ ୪.୧ ୪.୨ ୪.୩ ୪.୪ "Rickets - OrthoInfo - AAOS". September 2010. Retrieved 19 December 2017. ↑ Florin, Todd; MD, Stephen Ludwig; Aronson, Paul L.; Werner, Heidi C. (2011). Netter's Pediatrics E-Book (in ଇଂରାଜୀ). Elsevier Health Sciences. p. 430. ISBN 1455710644. ↑ Magnesium and vitamin D's co-factors, by John Jacob Cannell, M.D. citing The Lancet; The Vitamin D Council "Two interesting cases of Mg dependent Vitamin D-resistant rickets appeared in the Lancet in 1974. Two children, one age two and the other age five, presented with classic rickets. 600,000 IU of Vitamin D daily for ten days did not result in any improvement in six weeks—in either x-rays or alkaline phosphatase—and the doctors diagnosed Vitamin D-resistant rickets. Almost by accident, serum Mg levels were then obtained, which were low in both children. 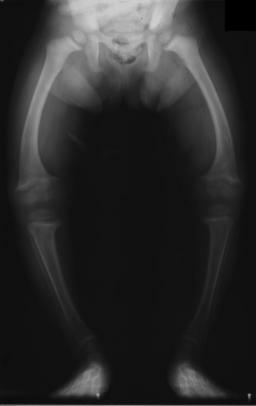 After the treatment with Mg, the rickets rapidly resolved." ↑ ୮.୦ ୮.୧ ୮.୨ Rajakumar, K (August 2003). "Vitamin D, cod-liver oil, sunlight, and rickets: a historical perspective". Pediatrics. 112 (2): e132–5. doi:10.1542/peds.112.2.e132. PMID 12897318. ↑ Brown, Mark (2018-08-19). "Evidence in the bones reveals rickets in Roman times". the Guardian (in ଇଂରାଜୀ). Retrieved 2018-08-20.